The endangered Devil’s Hole pupfish present a metabolic mystery that seems to defy the rules of biology. Here’s a fish story for you: Five years ago, researchers at UNLV launched what they expected to be a simple, one-week study of the endangered Devil’s Hole pupfish. What they netted instead was a metabolic mystery that seems to defy the rules of biology. It turns out the tiny fish found only in a single water-filled cavern 90 miles west of Las Vegas can survive for two hours or more without breathing any oxygen at all. 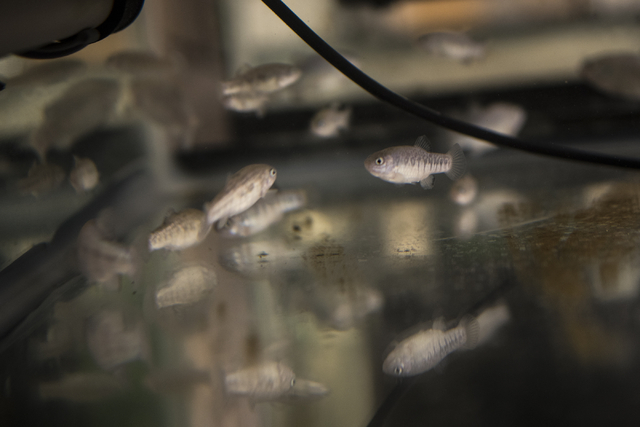 And stranger still: The pupfish will go without oxygen even when it’s plentiful around them, using instead an alternate method of generating energy that takes a toll on their tiny bodies much the way alcoholism damages the human liver. The fish aren’t holding their breath, exactly. It’s more like what happens in humans when they sprint — that extra burst of anaerobic energy that makes the muscles burn. But pupfish can keep their internal sprint going for as long as 149 minutes without showing any outward sign of strain. UNLV researchers Frank Van Breukelen and Stanley Hillyard call the phenomenon “paradoxical anaerobism” and, as the name suggests, it defies explanation. The water in Devil’s Hole is thermally heated to about 93 degrees and carries barely enough dissolved oxygen to support life. 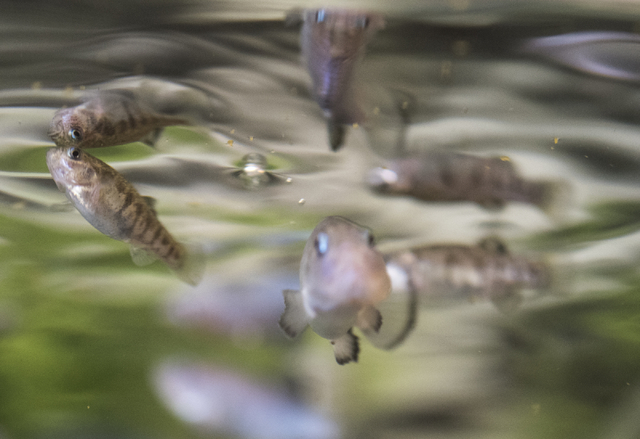 The pupfish found there and no place else on Earth have been under federal protection since 1967, but their numbers have dwindled to less than 100, prompting concern that extinction is imminent and unavoidable. Van Breukelen and company offer no predictions one way or the other, but their findings could be evidence of evolution in progress. At the end of the last ice age some 10,000 years ago, the bottom of Death Valley was covered by a vast, cool-water lake as deep as 300 feet. As the lake and its tributaries dried up, the surviving fish species were forced into isolated, spring-fed pockets across the desert. Van Breukelen suspects paradoxical anaerobism is an accidental biological reaction to that dramatic change in habitat. 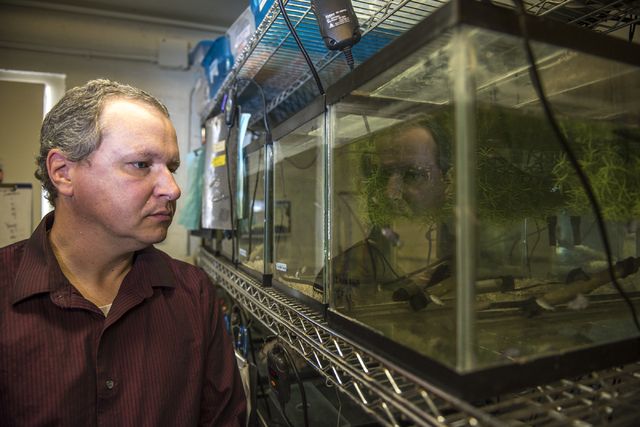 He and Hillyard originally set out with a simple goal: measure pupfish oxygen use to better understand the energy needs of the species. Then their experiment took an unexpected turn. 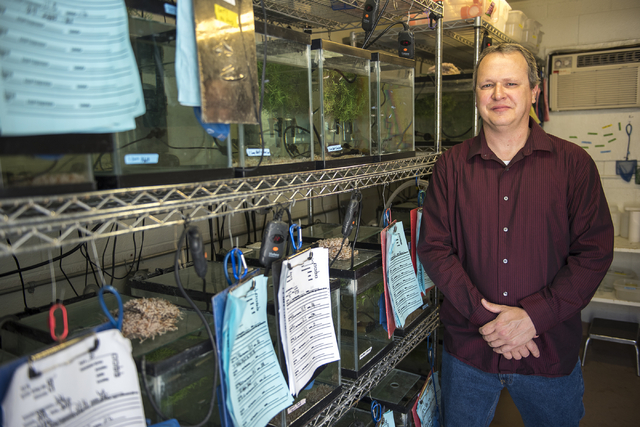 One week of study turned into several years, he said, as hundreds “if not thousands of fish” — all of them close relatives of the species in Devil’s Hole — were tested in hopes of understanding paradoxical anaerobism, what triggers it and what causes it to stop. Water temperature seems to play a major role, with the phenomenon occurring far more frequently in warmer conditions. Since Devil’s Hole is particularly warm, researchers suspect the fish there might rely on the unusual metabolic process quite a bit. As a result, the pupfish are likely being exposed to more of the main byproduct of paradoxical anaerobism: ethanol. Or, in layman’s terms, that stuff in your cocktail that makes you feel funny. 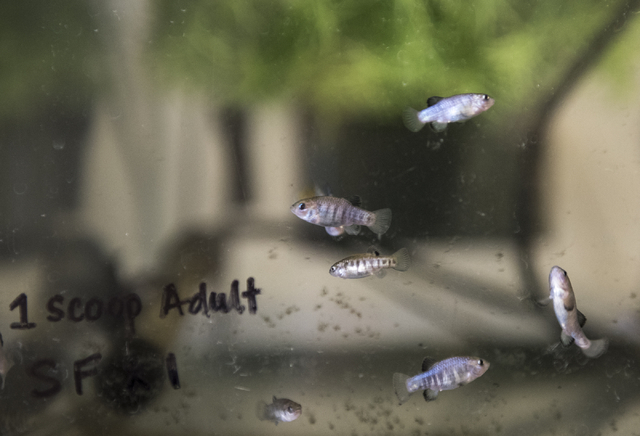 Van Breukelen said high ethanol exposure could help explain why Devil’s Hole pupfish only live six to nine months while similar springfish can live as long as four years. “They are essentially living like chronic alcoholics,” he said. 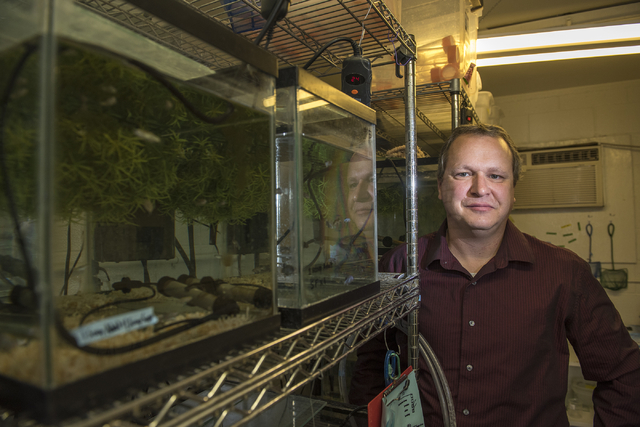 Hillyard presented a paper on the findings at the 2015 Experimental Biology conference in Boston in March, but the research isn’t over. Eventually, the researchers hope to venture out of the lab and into the desert near the Nevada-California border so they can measure oxygen consumption by Devil’s Hole pupfish in their namesake habitat. With any luck, that work can be done quickly and easily. But Van Breukelen isn’t holding his breath.